Skolkovo Foundation President Viktor Vekselberg (middle) awarding the 500th certificate and a crystal brick to Israel’s Parasight company. Source: Press Photo. Israeli medicine and biotechnology start-up Parasight will become the 500th participant in the Skolkovo Innovation Center. “It is impossible to figure out precisely what they’ve invented. 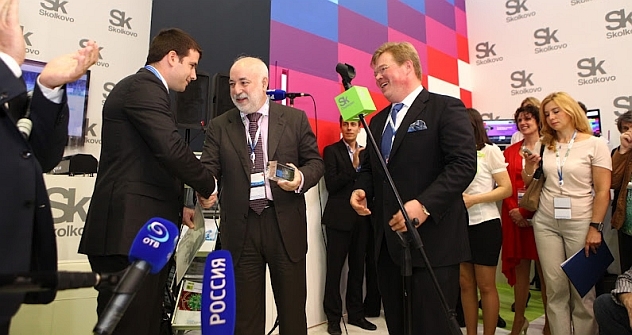 This is real innovation,” said Skolkovo Foundation President Viktor Vekselberg as he awarded a certificate and a crystal brick to Israel’s Parasight company, identifying it as the 500th participant in the Skolkovo Innovation Center. The start-up’s co-founder, Yossi Pollak had been developing computer algorithms for the automobile industry for six years when one day he invented a technology to improve blood testing. In 2010, Pollak, along with two friends from Israel who were then graduate students in biology at Harvard and Stanford Universities founded Parasight. At first, the researchers used a garage as their laboratory, but they soon discovered a technological solution that allowed for detecting malaria in human blood quickly and at a low cost. By 2011, after they had proven the viability of their research, the three young people were finally able to raise enough money to open an office in Jerusalem and hire 12 engineers to work on the project. “The year before last, I studied at INSEAD Business School in France. I entered our start-up into the Business Venture Competition,” Pollak said. “Although we didn’t need a lot of money to start and we could do with our own savings, as it goes deeper, scientific research requires more and more investment.” INSEAD’s competition requires businesses to be in their first year of operation and be free of any outside investment, even from family or friends of the founders. Sixteen judges assess the potential of the underlying idea, the soundness of the management and the credentials of the employees in three stages. First, they review the project’s summary. Second, they study its business plan, and third, the finalists personally appear before the jury to present their work. The winner receives a development grant of 10,000 euros; second place receives 5,000 euros. This is in contrast to Russia’s Skolkovo Prize, which comes with 25,000 euros and a trip to Moscow. Additionally, there is the possibility of joining the technopark. “About a year ago, we shared the Skolkovo Prize with our Australian colleagues – a company called Ayoxxa, also working on blood testing technologies. And in October 2011, we came to Moscow on a four-day trip,” Pollak said. After they visited several medical research institutes in Moscow, Parasight decided to open a branch in Moscow, obtain Skolkovo participant status, and relocate three or four key employees to the innovation center. “Russia is the country of great mathematicians. We are hoping to find good specialists here to work on our new algorithms. The local office will work in close partnership with the one in Israel,” said Pollak. As a Skolkovo participant, Parasight will also be in a position to meet many scientists working in its field. According to Pollak, Parasight is currently at a critical stage: it has obtained several patents for software, technological solutions and biological research methods, and the next step will be clinical trials, to be held in India. Simultaneously, a few more applications will be developed in Moscow, in new areas of business that the company has not yet disclosed. However, if clinical trials confirm the project’s viability, Parasight’s presence at Skolkovo will give Russia the opportunity to become one of the first countries to use the innovations.